Clarion News reports...River Valley Humane Society / Crawford County Animal Rescue - working on county issues. "In another matter, Tanya Tuell, of River Valley Crawford County Humane Society, asked the commissioners to increase the number of vouchers that a person can receive through the county's Spay-Neuter Assistance Program." 2/11/2015 Interview with WHAS TV re Pig Abuse event at 2015 Harrison County Fair. Paste and copy the WHAS TV link above until we can get a working link. "The pigs have health records, Byerly said, and they'll be walking through disinfectant before getting in the ring. There will be a veterinarian on site, just in case." A paid veterinarian on site to do what? X-rays, surgery. It isn't possible. And walking thru disinfectant? What about the feces and urine in the mud. The only way they can stop that is to not allow the pigs food and water for days ahead of the event. So starved, dehydrated, terrorized pigs being assaulted by humans. What a proud achievement for our species. If River Valley Humane Society and its nearly 10,000 supporters have their way, there will be no pig wrestling at the Harrison County Fair this year. Supporters of the Humane Society in Indiana's Crawford County are expected to speak out against a fair board move to include pig wrestling — described on the River Valley Humane Society's website as an activity in which pigs are "assaulted by teams of humans" — in the 2015 fair's festivities. "It's just a mistreatment of animals first and foremost," said River Valley Humane Society founder and President Tanya Tuell, 57, of Elizabeth. "If someone did this to a dog or a cat, they'd be charged with cruelty immediately." The Humane Society will attempt to sway fair board members during a meeting Wednesday night with a month of research and a series of petitions. An online petition campaign launched last weekend has gathered nearly 10,000 supporters from around the world. But fair board president Jeff Byerly said there is little chance they'll succeed, since the board has already contracted with a Rushville, Ind. promoter who will put on the pig wrestling event on the Wednesday of fair week in Corydon. Allowing the Humane Society to talk, he said, was more of a courtesy. Pig wrestling is something the board had been talking about for years, Byerly said, and when it was endorsed as a "great show" at a recent fair convention in Indianapolis, they decided to make it a reality. The pig wrestling in Corydon will include teams of four humans who pay to chase a pig in a muddy arena, Byerly said. If the humans can catch the pig in the 30- to 45-second time limit — something he said rarely happens — they have to touch the pig to a rubber tire. The pigs have health records, Byerly said, and they'll be walking through disinfectant before getting in the ring. There will be a veterinarian on site, just in case. The Harrison County Fair, which will be held July 12-18 in Corydon, is one of the oldest — if not the oldest — county fair in Indiana. The practice of pig wrestling is uncommon — if not non-existent — in Kentucky. Gib Gosser, who works with about 100 county fairs annually in his capacity as the executive director of the Kentucky Association of Fairs and Horse Shows, said he has never even heard of it. Tuell once had a Yorkshire sow named Sparkle, and although Sparkle never wrestled, raising her made it apparent to Tuell just how intelligent and sensitive pigs are. Sparkle didn't like strangers, and she reacted to foreign situations in a way similar to other domesticated animals. "I don't believe that anyone at the fair board or anybody thinking this was a good idea woke up one morning and said, 'Let's go be mean to pigs,'" said Tuell, who suggested that human participants of pig wrestling lacked a connection with agricultural animals. "This animal is just so foreign to them," she said. "They don't have a conflict in treating them this way." In addition to concerns about animal cruelty, the Humane Society is also concerned pig wrestling may pose a threat to the human participates, who Tuell said often come into contact with urine or feces expelled by a pig that feels threatened. During the fair board meeting, Tuell said, the Humane Society will suggest alternatives to the pig wrestling event, among them a mixed-breed dog show to advocate pet adoption. But Byerly said he has talked to representatives in at least four Indiana county fair boards. They only have good things to say about pig wrestling, he said — and none of them received any pushback from animal activists. Byerly, on the other hand, has heard from people all over the country. "It's gotten really stupid," he said. "... I mean, I have a voicemail on my phone right now from some lady in Oklahoma ranting and raving about this." Byerly maintains there's no basis to any concerns about pig wrestling. Board members just want a "good, entertaining show." "Nobody wants to see any animals hurt," he said. Reporter Kirsten Clark can be reached at (502) 582-4144 or on Twitter at @kirstenlmclark. A representative with Protect the Harvest visited the Harrison County Board of Commissioners Monday night to express concerns about the implementation of the breeder's permit ordinance. Created by Forrest Lucas, Protect the Harvest has a main objective to combat animal rights groups that it says are forcing their lifestyle on everyone through politicians and legislation, making life difficult for farmers, pet owners and the general public as a whole through higher food costs. Kara Jones, a Crawford County resident who spoke to the board on behalf of Protect the Harvest, said she believes the breeder's permit ordinance would not help matters and could even make things worse by causing health problems in dogs because of spaying and neutering. She said Protect the Harvest was formed to protect farmers, hunters and animal owners. "Most owners would relinquish ownership rather than pay a fine," Jones said. She also said the number of rabies vaccinations decreases when a breeder's permit is in place, thus resulting in a higher number of rabies cases. "You're going to run into problems ... It has failed in other places," she said of similar breeder's permit laws. The ordinance will cause a hardship for the poor and elderly, Jones said before asking the board to reconsider the ordinance. "Maybe decide to do something different," she suggested. Commissioner James Goldman then asked if anyone wanted to respond to Jones' remarks. Harrison County animal control officer Bruce LaHue took the opportunity. LaHue said that first and foremost the breeder's permit is not a mandatory spay and neuter program because pet owners only have to obtain the free permit to avoid spaying and neutering their pets. He said the goal of the permit ordinance is to encourage responsible pet ownership. "The one thing I'll say is that it doesn't get anymore unhealthy than what we have today," LaHue said. "You can't get any unhealthier than killing them. And that's what we're doing." LaHue said the animal control facility euthanizes, on average, 80 percent of the animals that are brought to the shelter. "We want more people to own animals, but we want them to do it responsibly," said LaHue, who contends that the average person will not be affected by the new breeder's permit ordinance. Goldman said the board has no interest in changing or relinquishing the ordinance, which is set to go into effect July 1. "We'll at least give it a chance, see how it works," he said. "We'll monitor it; the new commissioners will monitor it." It's not often the morning meetings of the Harrison County Board of Commissioners draw a large audience to debate and discuss an issue; normally that occurs at the board's evening meetings when most people are off work. But that's exactly what happened Monday, however, as supporters and opponents of the breeder's permit ordinance packed the Council/ Commissioner Room at the Government Center. At the board's last meeting, Robert Schickel of Lanesville — and a host of others — asked the board to repeal the ordinance put in place in November by the previous board of commissioners. On Monday, a dozen or more folks voiced their support for the ordinance and asked the commissioners to give it a chance. Tanya Tuell, formerly with the Harrison County Spay and Neuter Program, said the community, county government and those close to the animal overpopulation issue have worked hard to not only get the ordinance in place, but to also implement the spay and neuter program, build the animal shelter and fund animal control. "We've come a long way," she said. The ordinance, set to go into effect July 1, will require all dogs and cats in the county to be spayed or neutered unless a free breeder's permit is obtained (the ordinance needs to be advertised twice before it becomes law). Tuell said the ordinance is not a mandatory spay or neuter law and, in fact, through research, she couldn't find one mandatory spay or neuter law in the entire United States. Tuell said she contacted five of the eight communities quoted in the Protect the Harvest advertisement against the breeder's permit in the April 10 issue of this newspaper, and all five were reportedly incorrectly quoted. "I think that's very important to look at," she said. "If they aren't verified, they aren't reliable." Created by Forrest Lucas, Protect the Harvest has a main objective to combat animal rights groups that it says are forcing their lifestyle on everyone through politicians and legislation, making life difficult for farmers, pet owners and the general public as a whole. Farmers, including Peter J. Schickel of Lanesville, spoke against the ordinance for fear of losing barn cats that control the rat and mice population to protect cattle or other farm feed. Others said they have had their cattle dogs spayed or neutered in the past and they became lazy and ineffective. On the other hand, supporters of the ordinance cited dogs and cats they owned were just as active after being spayed or neutered. Lori Mayberry of Elizabeth said she has rescued four stray dogs in the town of Elizabeth that otherwise would have roamed the town and present a danger to the public. "All were someone else's choices," she said. "They felt they need not take care of them, that someone else would." Lori's daughter, Samantha, said it would be a mistake to overturn the ordinance because, once it becomes law, it will help decrease bad situations for neglected animals in the county. 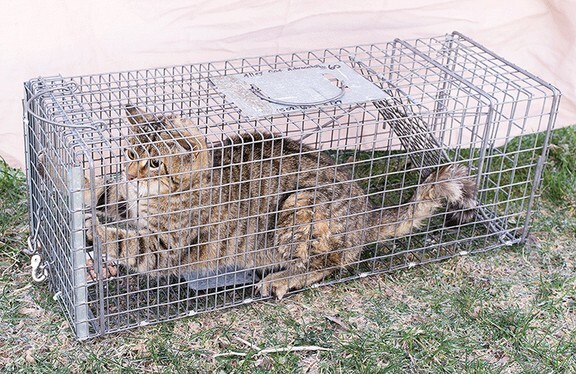 Another breeder's permit supporter said she had a neighbor with a tied-up female cat in heat having litter after litter. "It's not morally right," she said. Lance Kingrey said it was his second time attending a county meeting against the ordinance. "Where's it going to stop? Are you going to tell me I have to quit breeding horses?" he asked. Robert Schickel said he found 15 more pages, to go along with the previous nine he presented at the last commissioner's meeting, that cover animal control in the Indiana Code. "We just need to enforce what we've already got in place," he said. He said he thought the ordinance was created with good intentions, but it would have negative results and be costly to the county. He said it's not right for a law-abiding citizen to be fined for not receiving a breeder's permit. "Please repeal it," he said of the ordinance. Commissioner George Ethridge said he has owned two rescue dogs previously, and both were spayed. "I didn't want to deal with puppies," he said. "That was my decision. I would not have appreciated government telling me what to do and what not to do." Ethridge said the county already has an ordinance in place that deals with a lot of the issues discussed. "If you've not read this, please do," he said to the audience about the existing ordinance. "These situations have already been covered; they're all here." A copy of the ordinance can be picked up at the animal control facility or from one of the commissioners. Ethridge said he plans to have a meeting or two this month with only two or three representatives from each side of the issue and go over the existing ordinance. Commissioner Jim Klinstiver said he made the motion to approve the breeder's permit ordinance in November (Ethridge and Commissioner Kenny Saulman were not yet in office) after two years of input and he still believes it's the right thing to do. "I'm a fifth-generation farmer," he said. "I know about animals." He said farmers wouldn't treat their livestock the way dogs and cats are treated in the county as far as uncontrolled births. Also, he said it is difficult, if not impossible, to create an ordinance that pleases everybody. "We should advertise it twice (making it law) and we can always modify it once it's an ordinance," he said. The Harrison County Board of Commissioners, at least the two newly-elected ones, are on a path to repeal the breeder's permit ordinance put in place in November. If they do so, it would be a mistake. The general public may not see animal control as a problem until it effects them, their children or pets of their own. But ask any of those involved in the field, whether it be Animal Control Officer Bruce LaHue, spay-and-neuter coordinator Tanya Tuell, local veterinarians or the previous District 1 and 2 commissioners James Goldman and Carl (Buck) Mathes, respectively, who fielded calls on the subject asking them to do something about it, and they leave no doubt that overpopulation of dogs and cats is a problem in the county. Do you plan to attend the next Harrison County Board of Commissioners’ meeting to show support for the breeder’s permit ordinance scheduled to take effect July 1? For the farmers who expressed concern about the ordinance, both Mathes and Goldman are farmers and they had no problem with the ordinance and voted to put it in place. When it was put together, LaHue basically told the commissioners that farmers and other responsible pet owners will not have to do anything different after the ordinance takes effect (slated for July 1). At the very most, if their animals are ever in question, all they will have to do is visit the auditor's office and obtain a free breeder's permit. How the debate went from that to saying it's a mandatory spay-and-neuter program is hard to understand. There's absolutely nothing mandatory about it. No one is telling residents they can't allow their pets to breed anymore. A large group of folks attending the most recent commissioners' meeting expressed concern and asked for the repeal of the ordinance. A few were farmers, who have nothing to fear, and another was a 4-H representative worried that students would not be able to participate in certain events because of a lack of puppies or kittens. Again, nothing will hinder those families from breeding their dogs or cats. Others pitched their opinions and ideas as to what the commissioners should do. But they're late to the discussion. Last year, the Harrison County Council advised LaHue to form a committee to come up with a plan to combat animal overpopulation. The committee was made up of one representative each from the sheriff's department and prosecutor's office, along with a county councilman and commissioner, veterinarians and rescue shelter workers, among others. In one of the meetings with the committee, LaHue showed a slide of photos of barrel after barrel of euthanized dogs. LaHue said the images were too graphic to show at county council or commissioners' meetings, but that never-ending line of euthanized dogs, of all breeds and ages, is at the heart of the animal control problem. Maybe he should show those slides at a public meeting. The breeder's permit ordinance gives LaHue a tool he wouldn't otherwise have to punish irresponsible pet owners. For those who want to put an end to or slow down the couple of thousand animal euthanizations a year in the county, it'd be a good idea to show up at an upcoming board of commissioners' meeting in support of the breeder's permit ordinance. The supporters wanting to repeal the ordinance stood for a moment during the last meeting to show their support. It's time for the other side to stand up as well. The Harrison County Board of Commissioners and special invitees on both sides of the issue met last Wednesday afternoon for a work session focusing the breeder's permit ordinance. The meeting concluded with the board voting to repeal the ordinance by a 2-1 vote, with commissioners George Ethridge and Kenny Saulman, both whom took office Jan. 1 voting for, while Jim Klinstiver, who was elected in 2010, voted against. The motion technically did not repeal the ordinance but ordered legal counsel Chris Byrd to draft the necessary paperwork to do so. The motion also included reworking the existing animal control ordinance to increase fines in a tier system for cats and dogs that are not spayed and neutered. The tier system was introduced by Ethridge. Those invited to the discussion included Tanya Tuell, Travis Bushau, Robert Schickel, Chris Schneider and Matt Conrad. The mood became contentious for a brief period when Ethridge reiterated that the only remedy needed is enforcing the laws that are already on the books in the county. Tuell said that didn't fly with her because the breeder's permit would be a new tool for enforcement and nothing has worked with the current ordinance, so she didn't expect anything to improve as far as animal overpopulation and the endless piles of euthanized dogs and cats. Ethridge and Tuell continued to speak, or tried to, over each other. "If you don't want to listen, there's the door," Ethridge said to Tuell. From that point on, things calmed down somewhat, with both sides stating their case for, or against, the ordinance. Schneider said he pays enough in property taxes that go toward animal control and he shouldn't have to go to the trouble of registering for a free breeder's permit once a year. Klinstiver, who along with former commissioners Carl (Buck) Mathes and James Goldman voted for the ordinance in November, said the board should let the ordinance go into effect July 1 and then modify it if necessary. Tuell said the amount of animals being euthanized is heart-wrenching, and it is insane to think "we've got this ordinance, that's all we can do." Ethridge said people can't be forced to be responsible and there's no silver-bullet remedy to the problem. Animal Control Officer Bruce LaHue was not present at the meeting, which took place during working hours. At Monday's regular meeting of the commissioners, Ethridge and Saulman approved an ordinance to repeal the breeder's permit ordinance. Klinstiver voted against. The board also approved an amendment to the animal control ordinance already in place to increase fines for non-spayed or neutered dogs and cats running loose as follows: first violation, from $0 to $100 (with the option of spaying or neutering the animal to get fine waved); second violation, from $50 to $150; and third violation, from $100 to $250. The board also discussed enhancing adoption at the county animal control facility through website usage. Being told "there's the door" by an elected official is of no consequence to me. It is however an honest example of the negative attitude by some toward animals and toward those of us who care about animals; animal shelter staff; and our fellow citizens. I seriously doubt any other social issue would invite such behavior. Animal care and control matters have always been at the bottom of the social issues barrel. Those who recognize we in fact do have a responsibility toward animals have had to fight for every advancement. In addition, the radical anti-animal extremists who organized opposition to the ordinance displayed the behavior I fully expected and fulfilled my preconceived notions regarding those who always show up to beat animals down. The Crawford County Board of Commissioners, to the applause of most in the packed courtroom at the judicial complex in English, Thursday night ended discussion on an ordinance that would have required "proper shelter" for dogs and cats. The potential ordinance was first brought up at the commissioners' November meeting by Tanya Tuell, founder of River Valley Humane Society and coordinator of the Spay and Neuter Assistance Program in Harrison County and who has helped initiate a SNAP effort in Crawford County. Tuell, who has worked with the Crawford County Sheriff's Department to rescue neglected dogs and cats for the past couple of years, had requested consideration of the ordinance following the retrieval of several dogs earlier that month. The dogs, she told the commissioners at the time, were living in a small wired pen that didn't include a gate. Uncovered from the elements, the ground inside was a "mud pit," Tuell said, adding there were only two doghouses and several broken pieces for the nine dogs, two males on one side and seven females on the other. In addition, she said, the seven females shared a small water pail, which was full of mud when she was first there. Calling the dogs' living conditions among the worst she had seen, Tuell said the ordinance, which is identical to one in Harrison County, would assist law enforcement officers by providing them a better definition of what is a viable shelter and what isn't. •Means of shade from the heat and straw bedding or other means of protection from the cold. The ordinance also would have required each animal to have adequate food and water, and violation of any part of the ordinance could have resulted in a $100 fine. However, before the proposed ordinance could gain traction, concern arose that it would put too much of a burden on animal owners and potentially would open the door to restrictions on livestock, including horses and goats. Cara Beth Jones, of Marengo and the group Protect the Harvest, which represents livestock and small pet owners as well as hunters and fishermen, voiced opposition at the commissioners' Dec. 31 meeting. Jones then printed a copy of the ordinance in a full-page advertisement in the Feb. 20 issue of this newspaper that also asked animal and pet owners to attend the Feb. 28 commissioners' meeting and to ask them to spend tax dollars "on helping pets and pet owners — not making more criminals and lawsuits." Having answered her call, the majority of those in the full courtroom last Thursday night stood when Jones asked everyone who opposed the ordinance to stand. Many followed by verbally expressing their displeasure. One man referred to the ordinance as "just a bunch of B.S." Another, despite the commissioners being the only ones able to do so, made a motion the ordinance not be voted on things be left the way they are currently. That was followed by someone adding, "I second it," and another saying, "I third." Many people said abuse and neglect of animals shouldn't be tolerated, but that doesn't mean punishing responsible animal owners because of the actions of a few, especially when laws already exist. Jones told the commissioners that, wanting an independent review of the ordinance, she had an Evansville law firm read it. The firm, whose entire response was read by Jones, agreed that laws already exist to protect animals. She then held up nine pages of state laws that deal with animal neglect and cruelty. Saying that the proposed ordinance would limit freedom, Jones also read part of the Indiana Constitution. "So, we are trying to protect your rights. Someone said it isn't about rights, but, folks, it is about your rights," she told the audience, which broke into applause. Tuell, who said she hadn't planned to speak about the ordinance and that she was at the meeting to promote the SNAP program, said her goal in proposing the ordinance was to help animals. In the case of the November dog rescue, she said, all the owner would have had to have done to comply with the state law was to place a tarp over the pen. However, that wouldn't have helped much, she said. "Let me just ask you just one question. If you have a chained or penned dog that is confined, I mean, do you all believe that the dog should have a doghouse?" Tuell asked, as someone answered yes. "Because that's not what we're finding. I mean, I've got case after case that I have personally handled in Crawford and Harrison County. "So, that's what I'm saying. I felt like we needed this ordinance here. Maybe we don't. Maybe the sheriff and everybody feels like, you know, they've got enough to go on with the state law. That's all we were trying to accomplish. There was nothing else." April Minter, of Leavenworth, who was dressed in a dog costume to help Tuell promote the SNAP program, also noted that the ordinance had nothing to deal with livestock. "All this ordinance was about was these dogs," proclaimed an impassioned Minter, adding she was among the volunteers who helped in the November dog rescue. Following the approximately 30-minute discussion, District 1 Commissioner Daniel Crecelius made a motion that the commissioners abolish the ordinance. "Before I respond to Dan's motion," District 3 Commissioner Jim Schultz said, "I would just like to say that, for one, Tanya has put a lot into Crawford County in assisting us here, and I think her motives are very pure. I don't think she has any underlying motives in connection with this ordinance. I think she truly just wanted to protect animals, and I think that's what she was motivated by. "I'm going to second Dan's motion, but I did want to make that statement," he said. "I do appreciate her work and her efforts that she has put into our county. "I'm going to vote 'yes,' " Randy Gilmore, president of the board, said, "because I do think the law enforcement has the power, as stated in the state laws, to take control and do something about these animals. It's the landowner, folks. I hope it isn't one of you out there, but if you're treating an animal that way, you should be arrested." Crecelius agreed, saying that more laws are not the answer. "I think everybody's on the same page," he said. "We don't want to see animals treated bad. We don't want to see them mistreated or cruelty being done to animals, but we also just need to use a little bit of common sense in what we do."